Lately, I’ve been needled a lot about hand embroidery needles – lots of questions from beginners and beyond about this mysterious tool that we certainly can’t live without. Today, I want to share a few points about hand embroidery needles, so that you can make a good choice when you select the needle you’ll use on your next embroidered masterpiece. While we all have our favorite specialty tools, our most basic and most important stitching tool – the one we can’t do without – is the needle. 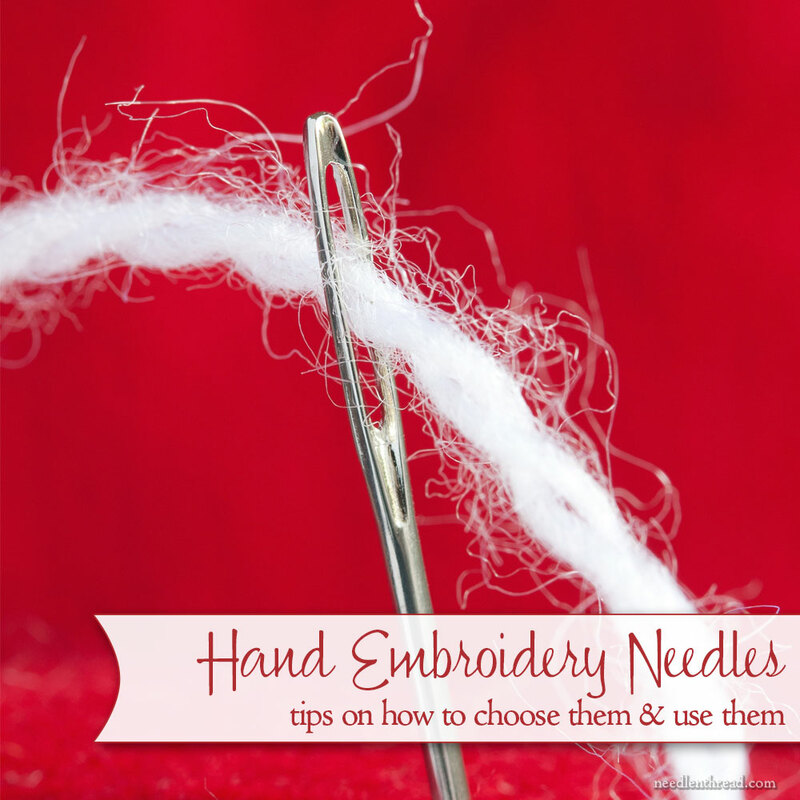 And choosing the right needle can make the difference between a frustrating or a pleasurable stitching experience. The type of needle you choose for your embroidery project depends on what type of embroidery you’re doing, but for those who embroider a lot, there are five categories of needles that you should have on hand. Here’s my list of five necessary types of hand embroidery needles and what they’re used for. Crewel needles are also called “embroidery” needles. Crewel needles have a medium-long eye, a shaft slightly thinner than the eye (the eye bulges slightly at the top of the shaft), and a sharp tip. They’re used for general surface embroidery, crewel work, goldwork, whitework, and practically any embroidery technique that requires a sharp needle. Their sharp tip makes them perfect for piercing tightly woven ground fabric and their slightly longer eye accommodates embroidery threads of various weights. Crewel needles come in sizes 1-12, with 1 being the largest and 12 being the finest. For beginners who aren’t used to selecting needles to fit their thread, purchasing a variety pack is a good idea. Variety packs commonly include sizes 3-9 or 1-5. Both packs are good to have on hand. Tapestry needles have a long eye, a shaft slightly thinner than the eye (the eye bulges slightly at the top of the needle), and a blunt tip. Tapestry needles come in sizes 13-28, with 13 being the largest and 28 being the finest. They are used primarily for counted thread work (cross stitch, blackwork) and needlepoint, or any needlework on fabric or canvas that has open holes that determine where each stitch is placed. The blunt tip of the tapestry needle helps us avoid piercing the fabric threads while we stitch. Tapestry needles are also used for whipping or lacing embroidery stitches. Whipping or lacing stitches involves passing under and around stitches that are already worked on the ground fabric, but does not involve passing in and out of the fabric often. The blunt tip of the needle helps us avoid snagging the foundation stitches. Whipped and laced stitches can be worked without a tapestry needle, too. If the needle has a sharp tip, just pass it eye-first under the foundation stitches. Chenille needles have a long eye, a shaft slightly thinner than the eye (the eye bulges slightly at the top of the needle), and a sharp tip. Chenille needles come in sizes 13 – 28, just like tapestry needles. Size 28 chenille needles are relatively new on the market, and they accommodate very fine threads. In large sizes (lower numbers), the chenille needle has a thick shaft. Size 13-18 chenille needles will seem positively huge to a stitcher who’s used to working with finer needles. Chenille needles are used in surface embroidery, crewel embroidery, chenille embroidery, and any time you want a large, long eye to accommodate your thread, and a sharp tip to pierce your fabric. In fact, many crewel embroiderers prefer chenille needles for crewel work because the eye is easier on the wool thread and the sharp tip and large shaft make a good hole in the fabric so that the wool thread can pass through relatively unscathed. 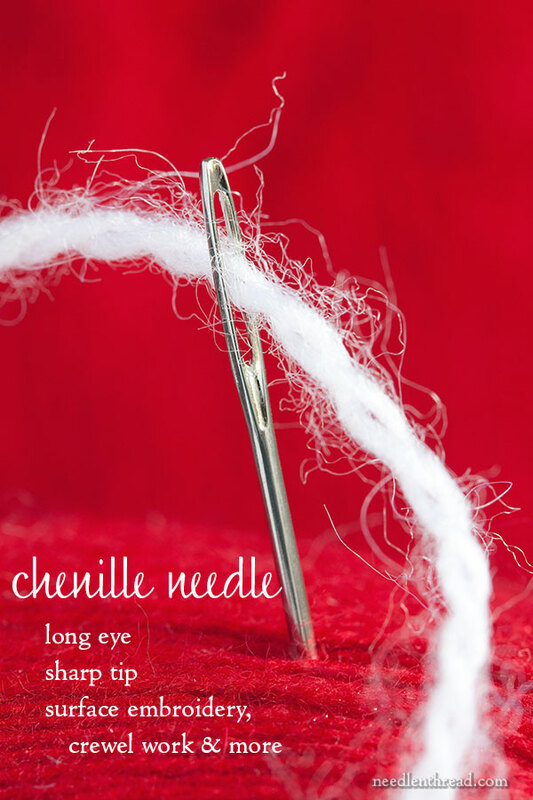 The long eye of the chenille needle also makes it ideal for stitching with specialty threads (braids, metallics, chenille thread, and other fibers) that have a tendency to shred. 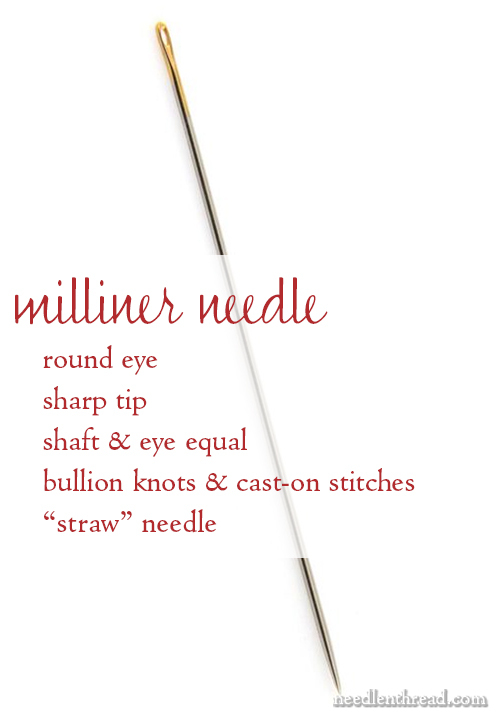 Milliner needles – also called “straw” needles – have a smaller, roundish eye, a shaft that is the same thickness as the eye (the eye does not bulge at the top of the needle) and a sharp tip. Milliner needles are quite long compared to the other needles listed above. Milliners come in sizes 1-10, with 1 being larger and 10 being finer. They can also be found in sizes 15 and 18, with 15 being larger than size 18, and 18 larger than size 1. Confusing? Yes. I have no idea why they are sized that way. Milliner needles are ideal for any type of stitch where the thread is wrapped around the needle several times and the whole needle has to pass through the wraps. Bullion knots, cast-on stitch, drizzle stitch, and even French knots are easier when worked with a milliner needle. The longer shaft of the milliner needle makes it easier to wrap the thread around the needle many times. By specialty needles, I mean especially curved needles, and,for those who do a lot of beading on their embroidery, beading needles. 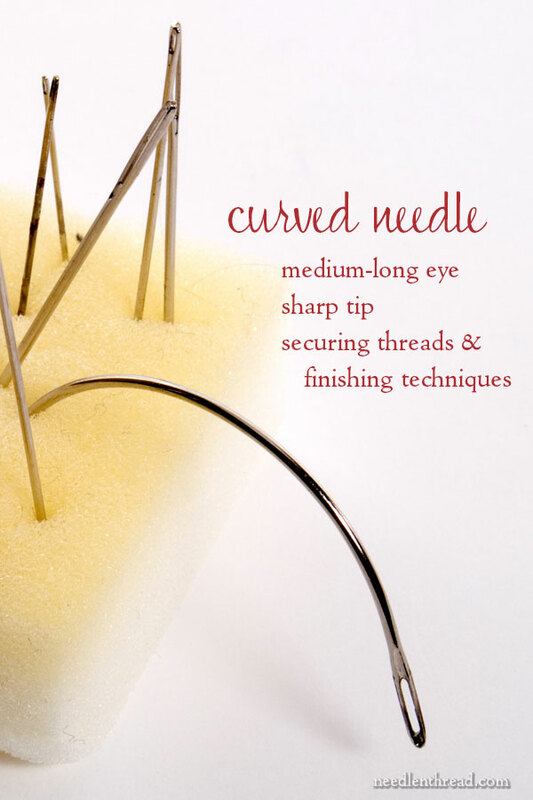 Curved embroidery needles usually have a medium-long eye, like the eye of a crewel needle. Curved needles come in a few different sizes. Some are very large (used for upholstery), while some are much finer. The size used for most fine embroidery threads is a size 10 curved beading needle. Curved needles are used to secure threads on the back of embroidery, especially in situations where the fabric is very taut and the backs of the stitches are small and tight. A curved needle is easier to use than a straight needle, when trying to run threads under the backs of stitches in these situations. Curved needles are also very handy for finishing techniques, because they can pass in and out of areas where a straight needle won’t work. Beading needles are very fine needles with long, narrow eyes, long shafts, and sharp tips. For most embroiderers who add accent beads to their embroidery, a regular crewel needle in a size 10, 11, or 12 will usually suffice in place of a dedicated beading needle. But for stitchers who pick up a lot of beads on the needle, and who use very tiny beads, a beading needle will come in handy. Experienced embroiderers generally acquire a feel for what size needle will work best in specific stitching situations. 1. The needle should be able to pull the thread (including the doubled thread near the eye) through the fabric fairly easily, without allowing too much abrasion on the thread as it passes through the fabric. The rule of thumb that I always heard growing up is that the shaft of the needle should be about as thick as the embroidery thread. But the only situations where this really works are in counted techniques, needlepoint, stitching on open weaves, and any other time there’s already enough space between the fabric threads for the needle to pass through easily. For surface embroidery, you have to consider not only the thickness of the thread, but also the thickness of the thread at the eye where the thread is doubled, and the weave of the fabric. A tighter, close weave is going to require a needle that can make the right-sized hole for the thread and the needle to pass through. 2. Although you may hear a pop as the needle passes through the fabric (the pop is usually most evident on very taut fabrics), there should be no real resistance in the fabric when pulling the eye of the needle through. If there’s resistance – if the fabric is pulling and denting, and you really have to fight to get the needle through – that’s a sign you should be using a larger needle. 3. Although there might be a soft noise as the rest of the thread passes through the fabric, there should not be a loud zipper noise. If the thread makes a loud zipper noise and you can feel resistance as you pull the thread all the way through to the end of the stitch, chances are, your needle isn’t big enough. 4. The hole the needle makes should be large enough for the thread to pass through, but not any larger. The needle should not leave a visible hole around the thread. Keep in mind that there is no absolute formula or rule for what size needle to use for specific threads. While general suggestions might be made, the selection of the needle is often based on personal preference – what needle are you comfortable with in this stitching situation? Over time, it becomes second nature to know what size needle will work best. Do you have any tips you’d like to share on needle types, uses, and sizes? Feel free to join in the discussion below! Many heads are better than one, so do weigh in with your own bits of stitching wisdom! October 20, 2014 The Needle You Need! What a wonderful resource this is! Clear as a bell and SO informative. Thank you, Mary! Aha. Thanks. I’ve found milliners needles good for hiding tatting threads because the eye part is not bigger than the rest of the needle. Just, by the way! Thank you for this information. I have some needles I used in Brazilian Embroidery. Now I know they are also called milliner needles. I have also purchased “straw needles” from the quilt store. Although they are much finer than my Brazilian needles they are also milliner needles. Thanks for clearing all of this up. Wow Mary what a great way to describe and display needles! You are really SHARP today. Thank you so much for the post. I found this very helpful, Mrs. Corbet. I need to expand my range of needles. All I have is a pack of sewing needles that are all the same size (which work quite well for most of my embroidery, actually), and a few miscellaneous needles that were my mom’s: one tapestry needle (which at first when I just did cross stitch, I called it my “cross stitch needle”), a few smaller crewel needles, and a very large crewel needle that I hardly ever use. Great article, Mary. Years ago I was not aware that there were different types of needle and just used whatever there was to hand. I’ve since learned that having the right needle can make so much difference when stitching. It is not so very long ago that I learned that the eye of a needle has a ‘right’ side and a ‘wrong’ side and that it is easier to thread a needle from the right side. It is not easy to see which is which but if you are having difficulty threading the needle, rotating it 180 degrees might just make it easier! Very good information. What about gold eye needles? Are they really easier on the threads? Being brand new to the world of stitchery, how do you “store” your needles once they are out of the package. So that I know which one is which? Do you eventually just know by sight? Or usage???? Or do you just put them back into the package? Maybe separate pin cushions or separate pieces of marked felt??? Great post, as always! I’m definitely going to purchase some Milliner needles to have on hand for French knots. Question: do tapestry needles differ in size from one manufacturer to another? Is there a way to identify the size of a tapestry needle if I’ve accidentally put the needle down or it’s become separated from its unique holder I use to keep my 24/26/28 sized needles separated? I just wondered if there is an industry “standard” (like length, perhaps?) to distinguish one sized tapestry needle from another? Thanks!! As far as circumference goes, yes, I think most needle sizes within certain “families” of manufacturers are the same. I can’t necessarily guarantee that’s the case for Pony needles that are made in India, but I think most English needle brands (John James, Richard Hemming, Thomas & Sons, etc.) are pretty much all the same as far as circumference (and even length). I know that French needles (Bohin, for example) might vary in length from English needles, but I think the circumference is about the same. Their eyes might be slightly more or less long, too. The standard sizes are based on wire sizes; that’s why needles are sized the way they are – they’re sized just like wire is, with lower numbers being heavier and higher numbers being finer. This is most helpful, practical information. I have many times wondered about tip #4, just how big of a hole the needle should leave behind. Thank you very much, Mary. QUESTION about applique needles! I recently bought some and discovered that the hole was too small for ANY kind of thread I could find in my stash! Do you know of a reference chart that correlates needle size to thread size/weight? Great article very informative and very useful information on different types of needles. I always look on Needle n’ Thread when I start a project to see what type of needle I need for my current project and I’ve used most of the above needles for all different types of embroidery, Crewel needles for general embroidery, Milliner for bullion and french knots, I’ve used tapestry needles for whipping and laced embroidery and chenille needles. My favourite crewel needle is made by Bohin which is easy to stitch with when passing through fabrics and I first read about these on Needle n’ Thread. The only needle I had difficulty with was the curved needle but I need to practice more with the needle to feel comfortable with it. Thanks so much for reviewing needles and the different tips and techniques on using the most fundamental instrument in needlework. This is a wonderful coincidence. I just finished collecting all the required needles for my new little Jane Nicholas stumpwork project. Had to go searching through a couple different books to make sure I had the right ones and even had to make a couple purchases. That was yesterday. And here’s your website today! Thank you. I’m keeping this information. Thanks for the info! I have the talent of bending the heck out of any size needle when I embroider. Any tips for me? I have a glut of needles,using whatever type looks appropriate. Never can figure out the sizes but I do know some brands are better than others. By the way, I believe gold eye needles are for some of our older eyes! I had been taught that needle sizes run from large to small 1- x and thread sizes from small to large. Now that has been blown out of the water with the information that a milliner needle 18 is larger than a milliner 1. Thanks for a very informative report on needles. 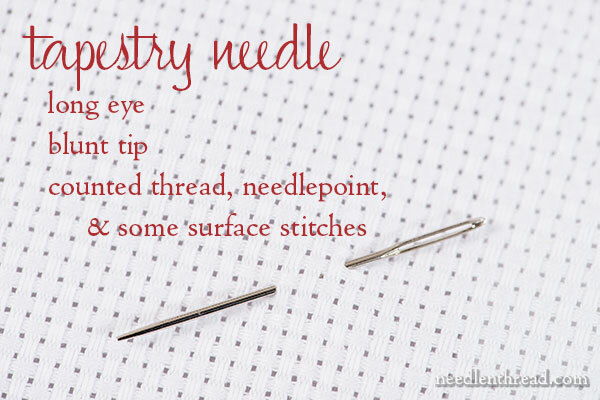 Do you have an tips on threading needles? My solution to threading needles is to have my daughter thread up 4 or 5 needles so they’re lined up ready to go! careful with my tension, but now I do thanks to the explanation given in #2 under the tips. Think I’ll print out and keep this handy for future reference. Thanks again. I always check for your posts as soon as I open my email. Yesterday’s book reviews were welcome. I have already ordered both. Today’s article is very helpful. 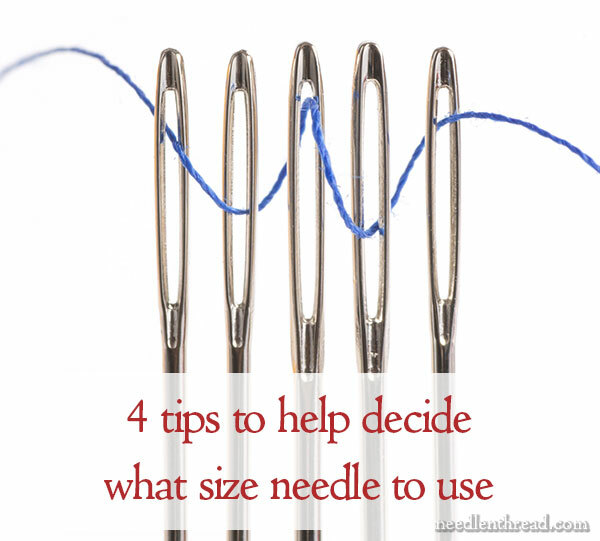 I especially appreciated the four tips for choosing the size of the needle. I have been going through all of your super helpful tutorials recently, but this article is particularly helpful right now. Thank you so much! Hi, Whitney! I’m glad you found it helpful! I have found that I love using the Chenille #24 on almost all of my embroidery. I’m not an accomplished embroiderer, so the redwork is perfect for me especially since I’ve developed arthritis and the larger size makes it easier to feel. I’m wondering if anyone out there knows where I can find size 8 or 12 cotton pearl thread. I can find plenty of #5 but the 8 & 12 are elusive. Thanks. I see both Pearl cottons (8 and 12 and also other sizes) at 123stitch.com. As ever, wonderful advice delivered with grace and humour. Many thanks! Thank you for the great info on needles. I so enjoy all the wonderful info that you share with us. Once I take my needles out of the package that they come in, I put them in a wood needle tube. I use a permanent marker to label the tube. Now I do not have to guess what size the needles are and I can easily take them with me. Thanks again for all the great tips, Mary. A tip for storing needles, I found a art bin type storage container at a sporting goods store that prevents rusting. It is supposed to be used for fishing hooks and lures. Where to do categorize betweens: I use this tiny fairy needles for stumpwork, and if some smaller petals call for two threads, I have a very hard time getting two threads through the eye. I have solved it by pulling through a single thread and then lying it doubled & pulling it through the fabric. But are there any other suggestions? 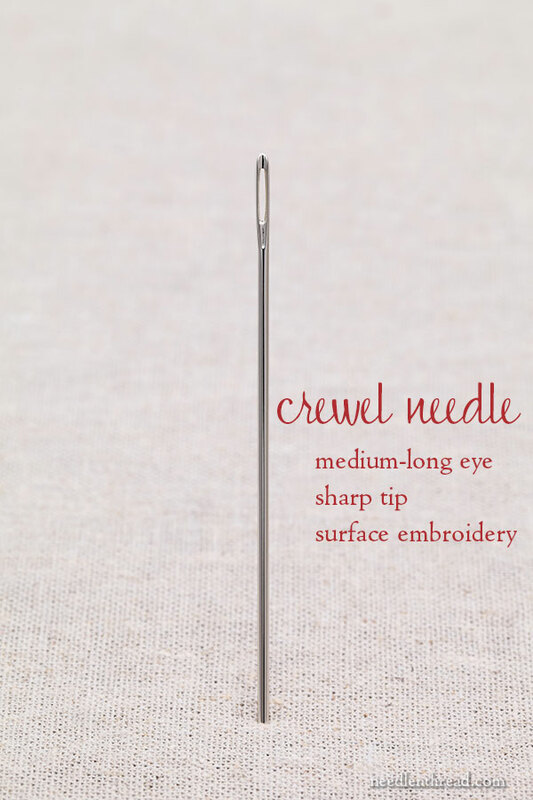 A finer crewel needle will give you the fine needle and the longer eye for easier threading. Great survey article, Mary! Milliner needles are used for smocking, too. The equal-sized eye and shaft make a perfect hole through which to draw LONG lengths of embroidery thread or ribbon without abrading the fibers. This is one of your very best columns. Will you allow me to print it in my EGA chapter newsletter? I know our members would really benefit from your advice, and they will probably join your daily emails. Hi, Elizabeth – I’ll email you the details! Thanks for asking! Great article. My latest project involves metallic thread and size 11 seed beads on a cross stitch work and it has been taxing and needle breaking to say the least. So I’ve been forced to go through my stash to find substitutes. Since my stash consists of a plethora of needles picked up in estate sales, I didn’t know what I had! Reading your article has helped me identify what I’m looking at and know now what the heck some of those funny looking ones are used for and why. Thanks for the tutorial. Mary, thank you SO much for this post. I’m teaching a beginning embroidery class for my local branch of a historical re-creation group. I’m lucky enough to have a grandmother and mother who taught me the basics. Hi My name is Cherie Syme and I am a member of the Canterbury Embroiderers Guild in New Zealand. I put together information for our new members and would like to include this information on needles with your permission please. Under your name and also your website in the document. Thank you. One thing I’ve noticed is that other sites hardly ever mention the fact that milliner needles are designed with the shaft and eye the same size, which makes them ideal for French knots and bouillon roses. I have been looking for a “primer” on hand sewing needles to send to my daughter-in-law since I made her a needle case / needle roll for Christmas and she wanted to know what the different needles were for; I think I found it! While on needles, what is your favorite way to thread a needle. I can go thru a threader every day!!!! Love your blog and work. Superior Thread had a quilt today that I think was embroidered with the tools you just explained. Awesome work. What some great info on needles. My French Knots always to seem to wobble. thank you for that, I’ve been looking for this information for a long time. Question: I love love working with the Millner. I just wish I could find one a little larger eye..does such a needle exist? I can’t find the perfect needle for me and I have looked all over the place. I have arthritis, so I need a strong needle, 3 inches long (so I can grab it), a nice sharp point, and I need it thick enough not to bend, but thin enough to make the little stitches. If the needle isn’t long I can’t grab it and I have trouble feeling it, so I have to be able to see it. I don’t know if this makes sense to anybody… but I have to see the needle with my fingers and my eyes… lol. If anybody knows where I can buy this wonderful needle, I surely would appreciate it and I would love you and put your name in my prayers forever & always… lol. Is there a large eye needle (for thick threads) that has a short shaft? I use a size 10 big eye needle for hand applique and find even a size 26 Chenille needle large and awkward. I’ve been doing some practice embroidery and cannot get comfortable or make even stitches. Thank you for this! I’ve been going crazy trying to figure out what my Instagram friend meant when she told me I should get a crewel needle for my big stitch quilting!!! Excellent article for those newbies like me. Thanks! I have heard of “straw needles” but didn’t know what they were used for. Your website is such a treasure of information. I do appreciate it, thank you so much. Pleased w/info about needle sizes and uses for various kinds. Very helpful. I’d go for a #3 crewel (or “embroidery”) needle, for starts. If that doesn’t do it for you, you can use a #1. But I think a #3 would suffice. I’d like to incorporate seed beads or similar small beads into my embroidery and I’d like to know what needs do you use for this? Thanks so much! Hi, Claudia – it really depends on the size of the beads and type. I’d try a #10 crewel (embroidery) or, for really small beads a #12 sharp. so, what size would you suggest for 10/2 pearl cotton? would a #7 work? or is there something more suitable. I think 10/2 is the classification for pearl cotton yarn that’s used in weaving, etc – it’s more of a “yarn” than the pearl cotton used in embroidery, which is three ply and a little sturdier, so it holds up better when passing through fabric. However, if you’re using 10/2, I’d guess a size 7 or 5 would work. Not sure if the results will be the same, but it’s worth trying! was invaluable!!! Think I will give them another try using the right needle…. I came into some milliners needles — Tulip needles from Hiroshima, Japan. Please tell me about them. I googled the 11-14 sized needles and found them available! I was just too curious about why they’d be missing. I’ll keep looking for that answer, although apparently the issue is solved. Thank you for your wonderful videos! and helpful embroidery tips. Where do I order these milliner needles the ones you have pictured in here that are long? They are used For Bullion or Cast on Stitches. Hi, Gracie – You can order the Bohin milliner package sizes 3/9 at Needle in a Haystack, here. Scroll down to embroidery needles and it’s in the section. Bohin Milliner / Straw 3/9 is how it’s labeled. Hope that helps! My favorite tip to share is to marry the needle to the thread. When I learned how to do this I had much less knots… if two threads are desired I use the half hitch method and cut one thread double the length of my forearm and then I fold in half and thread the two ends through the needle and then I pull it all the way down to the fold and slip the fold over the needle to secure it into place. These two techniques have save me from pulling out my hair with all those tangles and knots that get in your working threads from the twisting of embroidery or sewing. Hi, Julie – You won’t find a combo pack of #9 and higher. You can often find #9’s in a combo pack that covers sizes 3-9 or you can find #10’s in a combo pack that covers sizes 5-10. But if you want individual sized needles like 9, 10, and 11, then you normally have to order them in individually packages that are all that size. You can find a good selection of needles for embroidery on a couple different sites. I like Anita’s Little Stitches – they have a great selection of Bohin needles. Also, Colonial Needle has a good selection of other brands in all kinds of types and sizes. Any local needlework shop (if you happen to have a shop nearby that’s devoted just to needlework) will usually have a good selection of needles. Hope that helps! Hi, Debbie – Milliner needles are sized like other needles – the lower the number, the larger the needle. It depends on the type of crewel wool you’re using, but I’d probably look for a size 3 or 5 in a milliner, if you’re using a relatively fine crewel wool. Hope that helps! This is amazing! Thank you so much for the wealth of information! I will be perusing your site in the coming weeks for more embroidery basics and can’t wait to get started on some projects!! Ah. Mary darling you never cease to amaze me. Thank you for this valuable information. My choices of needles have been trial and error. With your information, I will have more success. I’m so thankful to have found your site a few years ago. Your tutorials have been a blessing. Again, thank you! i know this is an old article, and i know my question doesn’t directly involve embroidery, but i was hoping you could tell me what size of cheniile needle to use for 10/2 perle cotton. i’m stitching through 10 oz cotton duck, both single thickness and up to twice or thrice in the case of seams. would cheniile needles be good for that, or is there a different kind of needle more suitable? Oh gosh, would any needle be good for that? I pity your fingers!! 🙂 But in any case, yes, you’ll need a sharp tipped needle, and a chenille has a sharp tip. The larger eye will accommodate the perle cotton. I hope that helps! Best of luck! haha, fingers do pretty well thanks to a tailor’s thimble. oh and sorry to have wasted your time. after i posted my question, i found out i asked this very same thing last year, but could do nowt about it at that point. cursed feeble memory of thine. ta’ for the help, again. god willing it be the last time on this question. Then for ribbon embroidery, which needle would you recommend pls? Hi, Roseline – It depends on the size of your ribbon and the type of fabric you’re using. I’d probably start with a variety of chenille needles. I am getting ready to start learning to do embroidery. I do plastic canvas and I assume that embroidery is kind of like that except on cloth and using so many needles. I like the looks of embroidery on cloth. Is there anything else a newbee should know, like what kind of cloth, threads and would I be into all those needles right now? As far as I can see there are no places in my area that teach embroidery. Help if you can please? When you buy a new pack of needles and they have multi sizes in the pack how do you choose a spercific size needle from the pack eg a 16 pack of embroidery needles size 3-9 how would I choose say a size 5 needle from the pack? Hi, Marsha – Yes, there is. These needle ID cards: https://www.needlenthread.com/2012/07/needle-id-cards.html You can find them available at Needle in a Haystack online (www.needlestack.com) Hope that helps! I am hand embroidering a tea towel using size 5 pearl cotton. What size needle is ideal? With a heavy thread like #5, you’ll probably need a #3 crewel (embroidery) needle. Previous Previous post: Nice Iron-On Transfer Embroidery Books!